Update: I’m pushing back the date of the disability carnival. More news on this later, but notice this means you’ve still got time to contribute! Code for life is to host the August edition of the Diversity in Science Blog Carnival, with the theme Disability Awareness and Disabled Workers in the Science Community. When writing about diversity, people often first consider race, gender or sexuality; the dominant themes of past editions of Diversity in Science reflect this. This is your chance to contribute articles about disabilities and awareness of them in the science community. 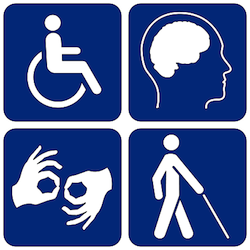 Disabilities cover a very wide range of impairments and severity. For the purposes of this carnival, I would like to open it to any form of disability. This is about diversity, after all. Submitters should write what they wish but I encourage writers to give a little background if the disability is less widely known and to bring out points that might be less obvious to others. Challenges associated with disabilities often stem from what others take for granted or aren’t aware of. As a simple (and easily remedied) example, people with a hearing loss can struggle if the person they are trying to listen to is sitting in front of a bright window. The strong backlighting results in the speaker being in shadow and the light blinds the listener from being able to lip-read them. Some might write on the technical devices or medicines used as aid or for support. Or the science related to a disability. Others might look at policy or history of a disability. This is, of course, a science carnival: if you can include elements relevant to a science setting all the better. In the laboratory. At lectures (on both sides of the lectern). Job applications. But feel free to focus on daily life too. After all we don’t live at the university, research institute or company 24/7! Submissions can be as long or short as you like; multiple submissions are fine. Submissions will be open until August 25th – you’ve got three weeks or so to write your masterpiece! I aim to review the articles over that weekend. Late submissions will be tolerated but try let me know so I’m aware of it in advance if you are able to. If you have questions, feel free to ask them in the comments below. First time comments are moderated; once you’ve had your first comment approved you can comment at will. 1. I have memories of one job interview where I confessed I couldn’t follow the interviewer’s questions because of the bright light coming from the window behind him. He kindly, and in hindsight comically, swopped places – leaving me in the large padded chair behind the big desk with the interviewer asking questions from the little chair in the middle of the room. 2. I would suggest using the Contact page but it has been a casualty of a recent update to the sciblogs backend and isn’t working at present. Only a week to go everyone! You don’t have to be disabled to contribute. You might be a student advisor. You might know some of the science behind a disability or technology used to assist. You might be the lecture co-ordinator and have to deal with the disabled access issues. You might know some angles I can’t think of right now! 🙂 Think broadly. Always used to type on the floor, until one day in my chronobiology lab, the keyboard wouldn’t reach the floor. Now I type with my nose! Always found biologists very accepting of me, but once I tried interacting amongst disabled advocacy movements again, that was where the fun started and I completely lost the plot. Fifteen years later, my unfinished thesis still waits. In one way, a grating noose around my neck, in another, still the subject that gets me out of bed and has me wanting so much explore the world as I did when my parents pulled me out of a special school because it had no science labs. I’m now 40, and hope against hope that one day I’ll end up w the confidence, and draft form of what was to be my thesis… to end up volunteering, playing around with other people’s datasets that no one else knows what to do with, finally contributing… At 40, a number of my friends in science academia are teetering on giving up after reaching such promise here and overseas… it seems I wasn’t the only one mortified by personal sacrifices and a lack of others realising what pressures there were to get a scientific research career up off the ground. How the hell were we supposed to also nurture healthy relationships and maybe create our own families? When with a disability, we are still with those questions, too. I just went insane, I completely lost the plot. People in the so-called disabled community wanted to see the young, angry and spirited in me in my midtwenties… I felt a responsibility to give back, but …. all i can try to explain is how it seemed I knew a solace in my studies, that I just couldn’t impart to others ; my inability to express what my interests in ecology and evolution has given to me, made me wonder how much of a spoilt brat removed from reality, I really was. Along with those friends who’ve I’ve encouraged to go for one more grant, one more fellowship… I’m hoping the maturity I think I gained through issues of my younger adulthood, might help me into a more sustainable way of incorporating all sorts into my life. I know it will be a long shot, my credibility at academic discipline, I feel, has long been left, easily regarded as wrecked. Great of you to drop and tell us your story. About the deadline for submissions: I’ll be moving that back a couple of weeks so if you do want to send something in it’d be great to read more. I see that suggesting that people “Get those fingers typing” wasn’t right for everyone. Sorry! Is it too late to re-enter the kind of life I once set out for? Indeed, this is just all story, all narrative, that others could frame in much, much less favourable terms wrt some very daft choices i made. I had to have so much understanding of my needs as they were, when i started out, what i have to convince others of now seems too formidible. Or, is it a form of just what anyone else, now picking up with a middle-age brain, has to go through?! Is there indeed, some kind of provision in science, for anyone who wishes to keep pushing on again, after formally being so absent from their field? I can’t afford the time to write a more disciplined piece, but I thank you for the opportunity taken here to reframe my narrative into something conducive to just getting on with it! yeah, btw, i use my knee a lot to steady my hand, so i jump down on the floor from my wheelchair a lot to do things which require dexterity – using my nose now, is actually more discrete! Kay – I’ll get back to you!